The performance of most diversifi ed Indian equity funds has been poor compared to that of funds focused on international markets in the past year. Between July 27, 2010, and July 27, 2011, the latter have returned 15 per cent on average, compared to the two per cent return given by Indian largeand mid-cap equity diversifi ed funds, as well as the Bombay Stock Exchange Sensex. Harshendu Bindal, President, Franklin Templeton Investments (India), says developed markets have done well in the past year due to attractive valuations and hope of faster economic growth. "The Indian market has underperformed due to tepid foreign institutional investor infl ows on the back of strong headwinds such as infl ation, scams, high interest rates and policy inaction," he adds. The US market, for instance, gave 12 per cent returns between August 2010 and August 2011. Hong Kong, Korea and Taiwan returned 9.2 per cent, 14.2 per cent and 8.5 per cent, respectively. The notable factor is the performance of countries in the ASEAN region, which led in returns. For example, Indonesia returned 22 per cent in the past one year, while Thailand returned 20 per cent. (See Sunrise in the East). The Propellant As the global economy faced turmoil, emerging markets, especially those in Asia, showed resilience and posted large gains. Bindal says higher economic growth and healthy banking systems in most Asian countries should continue to help them capture a higher share of global output. "The economies of the region are better placed due to lower leverage, high savings and rising consumption," he says. 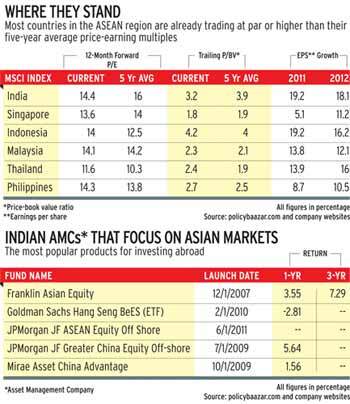 However, not all Asian funds have done well. One reason is the underperformance by China and India. Take Franklin Asian Equity Fund, which has returned eight per cent between July 27, 2010, and July 27, 2011. This is much lower than the 20 per cent return given by DSPBlackRock World Gold Fund, DSP BlackRock Energy Fund and ING Optimix Global Commodities Fund. Arindam Ghosh, Head, Retail Sales, JPMorgan Asset Management, says the ASEAN region is in a sweet spot. Apart from being rich in natural resources, the countries comprising the ASEAN have low debt. Their fast growing population will also fuel consumption. They are increasing spending on infrastructure as well. For instance, Indonesia is among the top fi ve countries in mining potential, has the world's fourth largest gold reserves and is the world's largest thermal coal exporter. Singapore is a large financial services hub with a lot of liquidity and a thriving tourism industry. The region is likely to become a powerful economic bloc by 2025. "From the Asia-Pacifi c growth standpoint, the ASEAN region will be next to India and China, with a big overlap with India in terms of youthful population and consumption," says Ghosh. Like India, the region - especially the Philippines and Thailand - offers cheap labour, which makes it strong at outsourcing. Tushar Pradhan, CIO, HSBC Asset Management (India), says the region is big in manufacturing, with the West as its main consumer. It got a huge impetus after the slowdown in 2008 when banks around the world gave incentives to boost consumption. "This fuelled economic growth, which spurred manufacturing in the ASEAN region," he says. However, with the fi nancial stimulus ending, consumers in the West may not have the same ability to spend, especially with an unemployment rate of more than nine per cent. So will the growth in the region be sustained? The silver lining, says Pradhan, is that these countries have large economies and are increasingly trading among themselves. The markets in the ASEAN region have risen signifi cantly in recent months and seem to be close to their fair valuations (see Where They Stand). Indonesia, Malaysia and Thailand are close to or above their average five-year price-earning, or P/E, multiple. Ghosh says people should invest in these markets not for their valuations alone, but also because corporate earnings growth is likely to be 15 to 16 per cent per annum. The Institutional Brokers Estimate System - a service that gives data on corporate earnings - believes the region is set for a fair degree of upgrades. In contrast, corporate earnings growth in India, which was 22 to 23 per cent a few quarters ago, has moderated to 17 to 18 per cent, with chances of further downgrades, says Ghosh. In China, too, the growth in corporate earnings has been just 15 to 16 per cent in the last few quarters. At present, the only way Indian investors can take part in the ASEAN growth story is through JPMorgan JF ASEAN Equity Off-shore Fund. It buys units of JF ASEAN Fund, which primarily invests in companies of countries that are ASEAN members. As on April 2011, it saw a compound annual growth rate of 19 per cent, based on a fi veyear record of investing in the ASEAN region. Although the region offers attractive opportunities, Bindal says investors must focus on long-term trends and fundamentals of companies rather than overall economic growth. He says from a medium- to long-term perspective, funds offering overall Asia exposure instead of just focusing on ASEAN have the potential to deliver better risk-adjusted returns. China too is worth considering for investment, though currently valuations here are among the lowest. The country is trading at 11 times earnings compared to its longterm average of 14 times. Stocks of real estate companies in China have been beaten down to 50 per cent of their net asset value, while banks are trading at 9x forward earnings. With fears of the economy worsening overstated, low valuations and expected earnings growth of 15 to 16 per cent, China is a great investment for the short to medium term, Ghosh suggests. There are various China dedicated funds on offer. These include Mirae's China Advantage Fund and JF China Equity Off-shore Fund. Investors can also put money in Hang Seng Bees, an exchange-traded fund offered by Benchmark Asset Management which invests in Hang Seng constituents (the Hong Kong stock exchange). 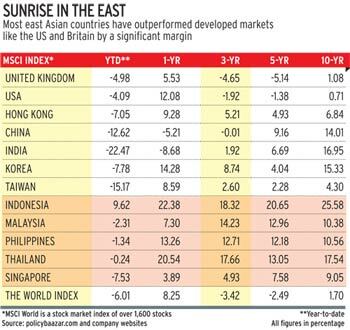 "Further, if we look at the performance of indices of various countries over long periods, say the last 10 to 12 years, no single country has been the best or worst performer in any two consecutive years," says Ghosh. This highlights the fact that countries offer different growth opportunities in different ways at different points in time, making it imperative to diversify across countries and regions. "All investors should have a majority of their exposure to core, diversifi ed funds that offer regional or global exposure and then move to country-specifi c or thematic funds," says Bindal.